Five years ago, few could have predicted that OnePlus would be where it is now. At its beginning, it created a powerful phone for tech fans with low budgets. Since then it has evolved. It still builds powerful flagship contenders, but with a lot more class and a more premium look and feel while still undercutting its big-name rivals. That has never been more true than with the OnePlus 6. It may have now been usurped by its successor, the OnePlus 6T, but it's still got the specs and performance to match the best phones on the market. At its launch, it very much a case of "out with the old, in with new" for the OnePlus 6. While some elements remain familiar in the OnePlus 6, the bold new design was something of a departure from the solid unibody metal phones of the previous couple of years. Like a few other Android manufacturers over the past year, OnePlus has gone with a glossy glass finish on the Mirror Black unit that we have. The multi-layered Gorilla Glass 5 surface on the back is dark, reflective and combines well with the polished black metal edges along the sides and the ends. Rather than go down the route of having multiple layers of different colours, OnePlus' glossy black glass is a single colour, but there's a little more to the other two finishes. The Silk White has a gorgeous, matte, frosty look and a feel that's almost like holding metal rather than glass. Similarly, so does the Midnight Black, and thanks to some very small perforations in the underlayer, it reflects with an intriguing S-curve when you catch it in the right light. It's similar to the black and purple finishes on the newer OnePlus 6T. One change we like a lot is the move to a much more symmetrical design on the back. The dual camera housing is pushed into the middle, with the two lenses stacked vertically, sitting about the dual LED flash and the new rounded rectangle fingerprint sensor. It's just as fast as previous sensors, but sadly not as useful as the 5 and 5T's. You can no longer swipe down to access notifications. The back is mostly flat, but similar to the previous two models it curves towards the edges to help give it a more comfortable in-hand feel. Surprisingly, despite being all glossy glass, it's not too slippery in the hand, and the central protrusion housing the camera does ensure that's it's not going to slide off absolutely every surface. While the materials and design certainly bring it more inline with popular flagship phones from the likes of Samsung, Huawei and Apple, there is one remaining feature that appears to be dying off elsewhere: the 3.5mm headphone jack. It's still here, ensuring those who prefer analogue wired headphones can still use them. Along with the addition of glass on the back, OnePlus has re-ordered some of the buttons and added a notched screen to the front. The Alert slider that switches between Do Not Disturb, Priority Alert and regular all alerts mode has now moved over to the right side, swapping places with the SIM tray. One downside here is that there's no official IP rating on this device, but that doesn't mean it can't handle getting wet. OnePlus has sealed the ports, buttons and internal components with a number of foam or silicone rings and barriers to ensure that it should survive getting caught in the rain, or being dropped in the toilet, providing you quickly remove it from the water and get it dry immediately. Still, some might bemoan the fact that it may not survive an accidental submersion that lasts longer, or being caught in a particularly nasty downpour. OnePlus' previous few devices have made great use of AMOLED panels, creating screens that are bright and incredibly vibrant. This year is no different in that regard. It may take the form of a 6.28-inch 19:9 display this time out, but the visual effect is just as striking on first impressions. The Optic AMOLED panel is Full HD+ resolution, in this instance that means 2280 x 1080 and a pixel density of 401ppi. It's a fully laminated screen, meaning the content looks as though it's almost sitting right on the surface. As with previous years, it does support both sRGB and DCI-P3 modes for those who want to step away from the saturated look of AMOLED, and make colours more accurate. These are among the handful of colour options available in the display settings menu. For our own personal preference, we found the default mode a little too vibrant and saturated. Switching to DCI-P3 meant there was still some vibrancy and plenty of colour, but without pushing it too hard. This mode succeeded in stopping reds from becoming too prominent and whites from being too cool. It's a good balance. Saying that, in the default mode this time out, it's not overly warm as it has been in previous years. In fact, whites are clean and cool, while reds aren't over the top. It's the most balanced OnePlus screen we've seen. One of the best parts of AMOLED though is that it can switch off individual pixels, so blacks look really black. This contrast and the saturation on offer means that even though Mobile HDR isn't officially supported on apps like Netflix, you still get an eye-catching display of colour and contrast when watching your favourite shows. You can't really discuss software without discussing that notch. It may seem like something more hardware based, but moving it into the software section is for one reason alone - it's when you come to software and optimisation (or lack thereof) that the notch becomes noticeable. In most day-to-day instances, the notch is fine. It doesn't get in the way, it's not a big deal, and actually, pushing the status bar up gives the display a more immersive look. If you hate it, you can dig into the settings menu and hide it. Again, not a big deal. The bigger issue is with Android and third party apps. There are many apps out there that aren't well optimised to deal with the screen intrusion, which can make for an inconsistent experience. With some of those apps, the status bar just colour matches to the predominant colour on the screen, but with others - as we've seen in several other notched Android phones - the status bar is just blacked out, just as it would be if there was no notch to begin with. In both cases, that means actual content within that app doesn't expand beyond the the notch, and so doesn't make full use of that extra expansive display. Calling it a big problem would be an overstatement, it's not really a problem at all. It's an inconsistency, and one that's noticeable. Thankfully Android P came to the OnePlus 6 before most other smartphones, and has built-in optimised support for notched phones. One would hope as app developers work towards making apps fully compatible with Android P, that these inconsistencies become fewer and farther between. As for the rest of the software, it's the same story as before - mostly. OnePlus's take on Android is clean, simple, fast and customisable. You can change the icon types, how big they are. You can also switch between light and dark themes. Perhaps the biggest change from a user standpoint is the option to go to gesture based control. Rather than have on-screen virtual buttons, you can just use a set of gestures to go to the home screen, go back or access the recent apps screen. These do take some getting used to, but after two to three days of fumbling and getting it wrong, they became second nature. Swiping up quickly from the right side of the screen goes to recent apps. Swiping up from the middle goes to the home screen and swiping up, then holding the middle of the screen activates recent apps. In our experience, the first two of those gestures proved quite fast and natural. The last, however, even after getting used to it, is noticeably slower than just having the recent apps button on the screen. On the whole, we think it's quicker to just stick with the traditional buttons on screen. With Android 9 Pie, you also get the single button Pixel-like gestures. This is a little less of a learning curve. You just swipe up on the button to go to recent apps, tap it to go home or press the back button to go back. As always, OnePlus has loaded the internals of the OnePlus 6 with the most powerful Snapdragon hardware available, as well as pairing it with plenty of RAM and storage. Even the lowest, entry-level model OnePlus 6 comes with 6GB RAM and 64GB storage. It should be plenty for most, but it gets better than that. This year you can also get either 128GB or 256GB storage, both with 8GB RAM, although there's no microSD. While all that RAM and the Snapdragon 845 do their part to ensure a speedy performance, there's more too it than that. For the past couple of years, OnePlus has built app prioritisation features into its Oxygen OS platform, meaning it doesn't waste its active memory on things that it doesn't need to. Apps that you need to load quickly will do so. In general day-to-day use, it feels snappy and fluid, taking any app switching and interface changes in its stride, without showing even the slightest signs of struggle. Everything just feels that little bit punchier and quicker than most other smartphones we've tried. Even loading quite large, graphically intense games doesn't take as long as you'd think it would. Playing games like Injustice 2, levels loaded without much waiting time and graphics were sharp too. 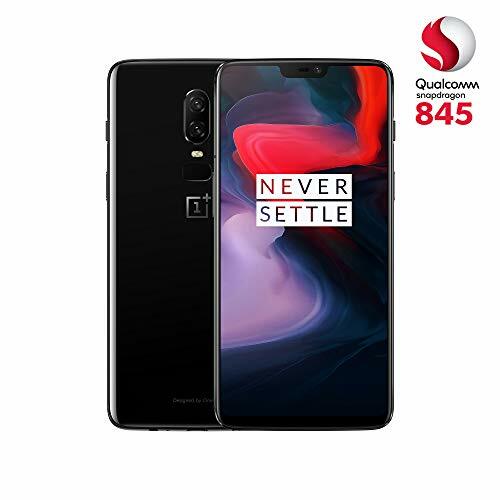 Not content with just making apps and games run fast, OnePlus has included Bluetooth 5.0, Gigabit LTE, aptX and aptX HD to ensure you get the best range, connection speed and wireless audio quality possible. We paired it with a number of different wireless headphones as well as a Wear OS and a Garmin smartwatch to see how it performed, and it did a good job of keeping a solid, reliable connection with those. One of the other benefits to the Snapdragon 845 is that it's also more efficient than last year's processor. OnePlus claims this has enabled them to keep the same battery performance, despite the fact that it has the same 3,300mAh capacity as the 5T, and has a larger screen. Our testing revealed performance that was similar to the 5T. On a particularly busy day travelling by train across country, listening to music, playing the odd game and keeping in touch with colleagues and social networking, the phone comfortably got from 7am to 11pm and still had between 20 per cent left over having been fully charged in the morning, and connected to a Wear OS watch all day. That's not bad going at all. So while it may not reach the dizzying heights of battery life offered by the Huawei P20 Pro, it's not miles away. For light users, we suspect you can approach close to almost two days of use, or at least well into the afternoon of a second day. On some of our quieter, less demanding days, the battery still had almost half of its capacity left over once the day was finished. Regardless of how much you use the phone, however, we guarantee that even if you get into a bit of a pinch, fast charging will come to your rescue. OnePlus' tagline of "a day's power in half on hour" holds true. When the battery dies you can plug it in for just 30 minutes and that is generally enough to get you over 60 per cent again. It charges really quickly, and can do so even when you're busy using the phone, thanks to the heat dissipating qualities of the included USB-C cable. As well as moving the cameras into the centre, OnePlus has improved the optics. As before, there are two Sony sensors on the back, one featuring 16-megapixels, the other 20-megapixels. Both have f/1.7 aperture, but the primary 16-megapixel camera has a larger sensor with larger pixels for better low light performance. Both have OIS to stabilise shaky shots. With Advanced HDR now included as well, OnePlus says that images will be much better, particularly in challenging conditions, enhancing lighting and bringing out shadows. In our testing, we noticed the camera improvement almost immediately. Everything about the camera experience has been improved from the previous phone. In good light, the camera focuses quickly, even on objects that are close to the lens. Then the end result is an image that's well balanced, colourful and attractive. The Advanced HDR does a good job of ensuring contrasting light conditions don't leave you with a bad shot. Highlighted areas aren't over-exposed or bleached, and shadows aren't completely dark. At times we felt it could lift the shadows a little more, sometimes leaving them a little too dark, but overall the images turned out well. One particularly challenging environment was shooting during the actual launch event. Spotlights following co-founder Carl Pei, and little lighting elsewhere meant that the camera's auto-mode would be trying to lift out details from the dark surroundings, but without over-exposing his skin. We tested alongside the Apple iPhone 8 Plus and managed to get the OnePlus 6 to show a more natural skin tone, retaining detail, while the iPhone seemingly couldn't. Each time, bleaching the skin, losing detail in bright areas. In lower light situations, in automatic, regular photo mode some noise does creep in a little, while details seem slightly spongey. However, with the Android Pie update also came some new low light camera capabilities. Since it's based on the same hardware as the 6T, the OnePlus 6 has now been equipped with many of the same camera features, including Night mode. With Night Mode, as is the current trend in top smartphones, you can take a picture in the dark completely handheld, and the phone will stabilise a long exposure to bring in lots of light and detail, without any of the blur that comes with keeping the shutter open normally. It's not just about how good the images turn out, actually using the camera is an easy, fuss-free experience. Unlike the camera apps from Samsung and Huawei, the UI is uncluttered and simple. You don't get a screen full of confusing additional options and settings. Instead, alongside the viewfinder you switch between video, photo and portrait. There are other shooting modes, which you access by sliding up or across from the bottom/right edge. Here you can choose slow motion, pro mode, time-lapse or panorama in addition to Night. That's it. In total that's eight useful, basic but effective shooting modes. It's not just still photography that's seen an improvement this year though. Video capture has been enhanced. You can shoot 4K resolution at 60 frames per second, stabilised electronically. There's also a new slow motion capability which takes a different approach to the super slow-mo offered by Sony, Samsung and Huawei. As you'd expect, this doesn't work so well in low light or artificial lighting, but shoot in bright natural daylight and you get some great results. Rather than shoot 960fps for a very small fraction of a second, OnePlus is enabling 480fps at 720p resolution, but letting you shoot at that speed for an entire minute. What's more, there's a built in video editor for adding slow motion, reversing or looping clips. The OnePlus 6 is an awesome phone and would - quite frankly - be a competitive flagship even if it was priced to match its competitors. It's not, and as such its current £439 price point makes it complete no brainer. This is the company's first no-compromise smartphone, and it offers much the same performance and experience as the more expensive 6T. To match the camera performance of devices like the Pixel 3 or Mate 20 Pro, it needs to improve at low light photography, but that's not to say it's bad. Its performance virtually matches, and in some ways betters, its more expensive competition. We're still not sure the dual system is necessary though. The OnePlus 6 is an easy phone to recommend. It's not just a flagship killer, it's a killer flagship. Huawei's latest big, all-powerful flagship has a really long lasting battery and a ridiculously good camera. The night mode built into the camera is staggering, almost unbelievable. The EMUI software still divides opinion, but this is without doubt one of the best phones launched in 2018 so far. Samsung has been building powerful, brilliant feature-rich smartphones for years, and the latest is more of a subtle evolution on the 2017 model. Still, the camera is great in most conditions, it's waterproof and has fast wireless charging. While the Pixel 2 XL launched under a cloud of screen-based woe, the Pixel 3 XL is a much better piece of hardware. People will moan about the notch, but if you've used the phone, it's really not an issue. Aside from the notch, the display is one of the best out there: it's wonderful to look at and sitting in a phone that feels great to use.